Jim Morris: Big Oil, Bad Air! A national eco hotel program is gathering steam as membership doubles in TripAdvisors GreenLeaders hospitality division. 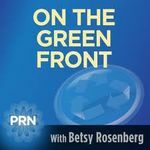 Jenny Rushmore talks about progress in the effort to make America's hotels and motels less wasteful and more resource efficient. Betsy Rosenberg on Earth Week 2012: The Eco-evolution Will Not Be Televised! Geoff Haines-Stiles on Earth Week 2012: The Eco-evolution Will Not Be Televised!